but it is only extracting only 3. I want to extract 3176972 number. Amend your regular expression to look like example.com/people/(. *) or example.com/people/(\d+) as your regex stops after first match. See Regular Expressions chapter of JMeter's User Manual for more information on JMeter Regular Expressions. 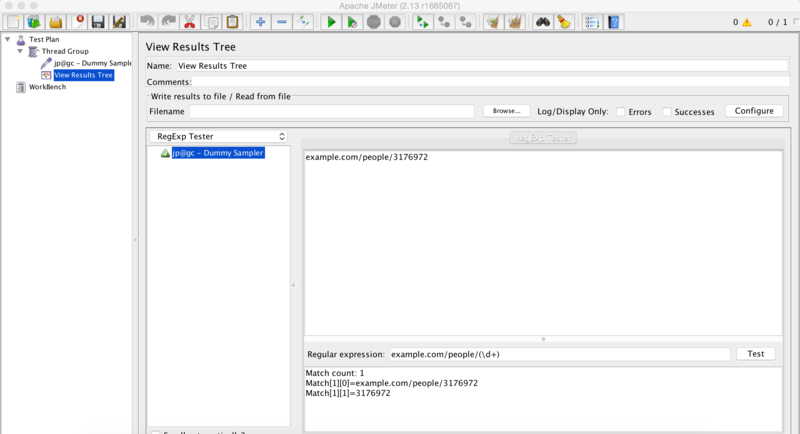 Convenient way of testing regular expressions is using "RegExp Tester" mode of the View Results Tree listener. Check out How to debug your Apache JMeter script guide for more information on different debugging techniques for JMeter tests. (question mark tells it to be non-greedy, hence it's taking 1 character). Regex plus vs star difference?